There are so many multi-dialed chronographs to choose from — and if you’re in the market for a new watch you know just the abundance I refer to. 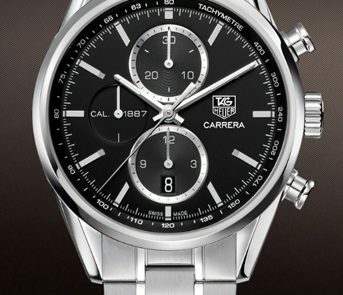 But seldom does one pull off such sporty elegance like Tag Heuer does with the Carrera Men’s Chronograph CAR2110.BA0720. The dashing silver and black dial resting on polished steel is classically handsome. And, of course, that’s not all. It’s also powered by the innovative chronographic precision Tag Heuer is known for around the track. 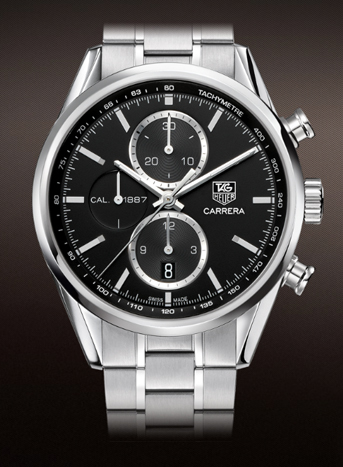 Inspired by motor racing, this is part of the Carrera collection dating back to 1963. Tachymeters were first introduced by Heuer in 1953 for rally drivers to determine whether the car was achieving the desired pace over a measured mile. This one has kept a small one along the flange, so you can still measure average speeds. Spiral-textured Sub-dials appear at the 12 and 6 o’clock positions displaying minute and hour counters and a date window. In the 9 o’clock position is a running-second dial. 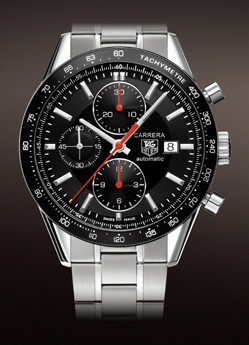 Tag Heuer has added over 30 new models to the esteemed Carrera line, all of which are automatic. With some as small as 39 mm and some as big as 43 mm, this one fits right in the middle with a 41 mm scratch-resistant sapphire crystal. Part of the Calibre 1887 series, this model comes in 4 different versions, differing only in bracelet material and dial color. Personally, I love the look of Carrera Men’s Chronograph CAR2110.BA0720 with black alligator skin, which just adds to its classic look. But you can also get this watch with a white dial on either bracelet. If you want to see this same watch but turbo-charged, take a look at this one from the Calibre 16 series. It’s quite similar apart from the calendar window placement and the tougher black bezel. Also, reflecting the dashboard of a race car, it has three red hands that bring together a more sporty look. 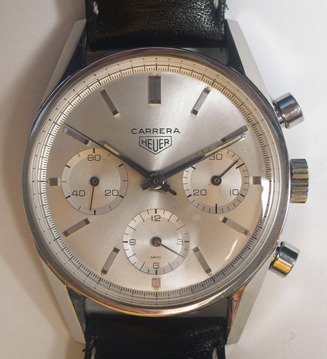 Some of the new Tag Heuer Carreras have stayed true to their 1960s styling. 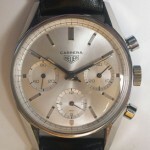 Tag Heuer has been making excellent chronographs for a very long time. But I don’t recommend this watch just out of nostalgia. I recommend it because it’s held true to the collection’s unique style without sacrificing contemporary sophistication. Look at this Carrera from the 1960s, for example. They’ve maintained its great classic style, but changed just what was necessary to give the Tag Heuer CAR2110.BA0720 sharp modern appeal. If you ask me, they hit the mark.